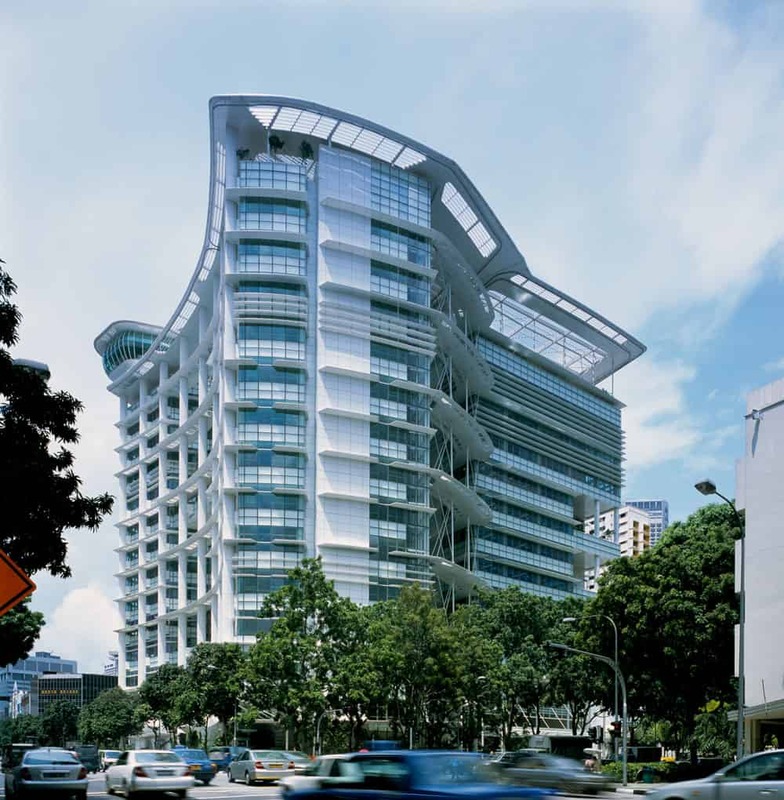 Ken Yeang is one of the most renowned environmentally conscious architects today. The National Library Building in Singapore required a state-of-the-art sustainable design that would serve as a landmark for the region. The requirements from the client needed a facility that would also act as a cultural centre as well as an enjoyable civic space for the people of Singapore. Architect Ken Yeang yet again found an opportunity to impart his mark of sustainability in the Tropical region. The design of the building has two blocks separated from each other by an atrium. The atrium is fully day-lit and semi-enclosed to drive light into the various parts of the building while helping facilitate ventilation. Bridges in the atrium act as linkages between the two blocks. The larger block of the project accommodates the library which is located over a naturally-ventilated civic plaza that is open to the sky. The smaller block is a curved entity that houses all the noisy activities including an exhibition, auditorium and a multi-media space. The architects resorted to having a differentiation in terms of space configuration hence ending up with the two halves that represent a quiet library section sitting alongside a noisy public activities space. The intention was to create an interesting library facility that can pull people, not just for the purpose of reading but other public and creative activities as well. The building is oriented away from the East-West axis to avoid exposure to the afternoon sun. The southwest side has a solid wall that permanently prevents direct sun rays from getting into the building. Sunshading blades have been fitted onto the building’s facades to prevent excessive heat and glare. Other facades also have sunshaded glass panels that let in natural daylight. The usage of artificial indoor lighting is minimized by light shelves that reflect daylight deeper into the building to help in lighting interior spaces. The atrium, which the architects, T. R. Hamzah & Yeang, refer to as the internal ‘street’ is the main focal point of the whole project. On the ground level, it serves as linkage between two active streets (Victoria Street and North Bridge Road). It’s a Public Events Plaza; a communal space that also leads visitors into the main foyer. Retail areas, cafes, and a library shop bring activity into the plaza. 14 landscaped gardens in the complex are filled with 120 species of tropical plants which help in regulating daytime temperature inside the building. 2 accessible gardens by the public are located on two different levels of the building. The Courtyard, located at level 5 is equipped with outdoor audio-visual facilities. The Retreat, the second garden, is located on level 10 and offers a pebbled foot-reflexology path. The other gardens are normally closed but maybe opened for special events. Smart technology systems have been adopted for the National Library building to help reduce energy consumption. Rain sensors, for example, reduce the amount of water that goes into the irrigation systems for the indoor gardens during the rainy season. Light sensors also dim or switch off the indoor lights when the interior spaces exhibit sufficient day lighting. Motion sensors have been installed in the escalators and toilet taps to ensure these facilities switch on only when they are in use. The air conditioning system is adjusted every so often to regulate carbon dioxide levels in the building as well as maintaining favorable temperature. The holistic consideration of green materials cap architect Ken Yeang’s desire to reduce the impacts of building materials on the natural environment. With the building achieving up-to 31% in energy savings as compared to non-green buildings of its size, it’s definitely a keenly done design with systems that help towards an environmentally low-impact design.